Web Album Maker is a gallery software which makes web albums of digital images from professional HTML and Flash templates. With clicks, Web Album Maker creates HTML photo albums, JPEG thumbnails, and CSS for your online photo albums. It can create thumbnails of your photos and display them in index pages in HTML. It can also produce slide shows of your photos for easy navigation. This photo web album generator creates online photo slideshow. Some software tools provide features to create online photo albums. For example, in Photoshop, user can choose from main menu of "File->Automate->Web Photo Gallery" to automatically make a photo album for web page. But this function is limited and not designed for diversity of user requirements for online photo albums. Web Album Maker is the fastest and easiest way to share your memories online. This wizard based application can easily create state-of-the-art HTML slide show of your digital pictures, ready to place on your Web site. Believe it or not? Web Album Maker is a FREEWARE! 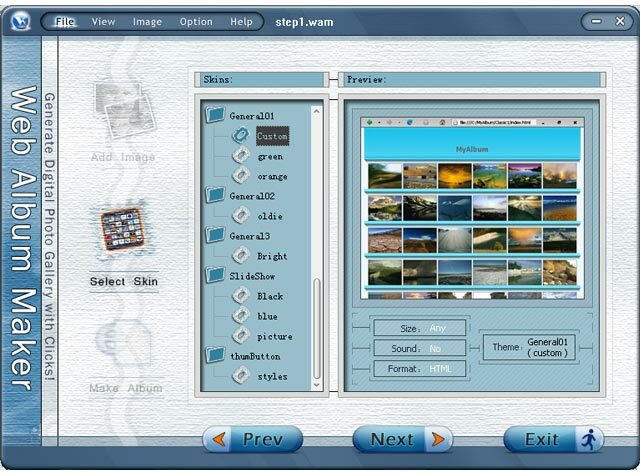 Now, with this amazing FREEWARE, you can use your images or photos to create web albums and galleries. Qweas is providing links to Web Album Maker 2.20 as a courtesy, and makes no representations regarding Web Album Maker or any other applications or any information related thereto. Any questions, complaints or claims regarding this application Web Album Maker 2.20 must be directed to the appropriate software vendor. You may click the publisher link of Web Album Maker on the top of this page to get more details about the vendor.